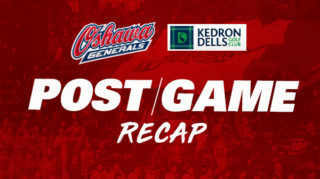 The Generals closed out the weekend this afternoon against the Sault Ste. Marie Greyhounds at the Tribute Communities Centre. After two big wins over the Petes this weekend, the Gens entered the contest with a 30-18-2-0 record on the season. 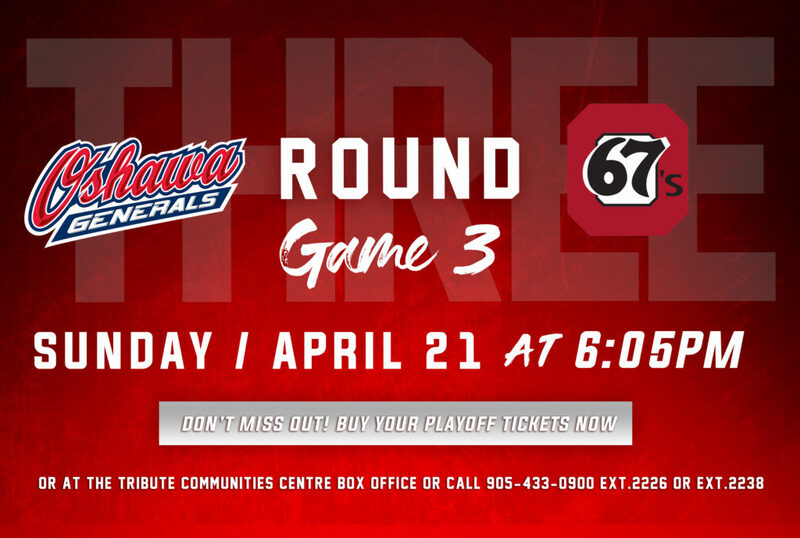 Looking to finish the weekend off on a high note, the Gens aimed to grab their third straight victory of the weekend. 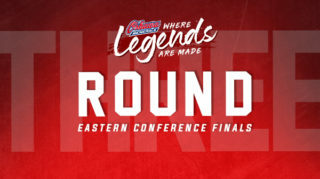 The Gens opened the game with a high-quality chance right off the bat, with Anthony Salinitri getting sprung on a breakaway that Greyhounds goaltender Matthew Villalta was able to stop. After the chance, the Gens took the first penalty of the game for tripping to put Sault Ste. Marie on the powerplay. 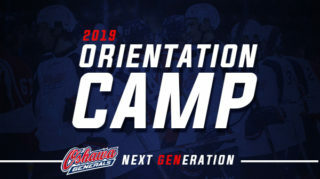 With strong play from Oshawa goaltender Kyle Keyser, the Gens were able to kill off the penalty to keep the game scoreless. Just past the halfway point of the period, Oshawa got their first try on the man advantage when the Greyhounds were called for holding. They got several good looks on net during the opportunity, but the Gens weren’t able to pot one. The Oshawa powerplay was given another chance late in the period when the Greyhounds took a tripping penalty. While they didn’t score on the powerplay, Serron Noel came streaking in from the wing back at even strength and put a perfect shot through Sault Ste. Marie to give the Gens a 1-0 lead heading into the second period. The period began with Keyser making a huge save on an early chance by the Greyhounds to keep them off the board. Sault Ste. Marie continued to pressure the Gens, but Keyser stood tall and made another amazing pad save to keep the Greyhounds at bay. Five minutes into the period, the Gens were called for a slashing penalty but managed to kill off the resulting Greyhounds powerplay with a strong defensive effort. After the penalty kill, Brandon Saigeon put on a great solo effort to flip the puck past the Sault Ste. Marie defense and pot the loose puck to put Oshawa up 2-0. 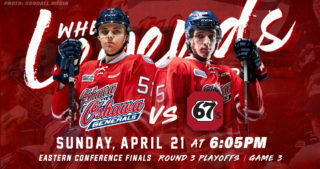 With momentum on their side, the Gens got another chance on the powerplay when the Greyhounds were called for holding in the latter half of the period. With Saigeon ripping a shot off the post on the man advantage, the Gens were close to adding to their lead but came up just short. The Gens were next to take a penalty, getting called for hooking near the end of the second. The Greyhounds were able to capitalize on the chance and put a shot top corner to put the game at 2-1. Continuing to find their offense, Sault Ste. Marie added another goal with under a minute left in the period to tie the game at 2-2 going into the final frame of the game. Beginning the period on a powerplay from a Greyhounds penalty taken at the end of the second, the Gens couldn’t find the back of the net on the man advantage. Six minutes into the period, Oshawa took a penalty for slashing to give the Greyhounds a powerplay. On the penalty kill, Kyle Keyser made a highlight-reel save on a Greyhounds 2-on-0 in which he stretched across the crease and got his toe on the puck to deny the chance. With the amazing save and good defensive play, the Gens killed off the infraction to keep the game tied at two. Through the midway point and latter half of the period, the teams exchanged chances on net and offensive zone time as the play went from end to end. With under five minutes left in the third, the Greyhounds got called for cross-checking, but the Gens powerplay came up short. With neither team finding the go-ahead goal in the remainder of the third period, the game headed into overtime. Both teams started off the 3-on-3 overtime with plenty of speed and chances, with the two goalies coming up big. However, it was the Greyhounds who were able to get the winning goal with Mac Hollowell completing his hattrick to give Sault Ste. Marie a 3-2 victory. 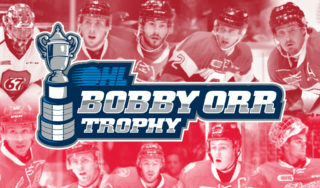 With the close contest finishing off the weekend, the Gens will look to rebound next week when they take to the road to battle the Bulldogs and Otters before returning home to face the Barrie Colts on Sunday.